Leaded Polysteel Pot Rope in diameters 10mm, 12mm, 14mm & 16mm sold in full coils of 220m, on handy cardboard reels and cut to length by the metre. 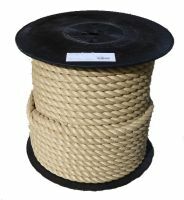 This Heavy Rope is tough, durable & hardwearing and will sink over time in water making it ideal as a Crab Rope, a Pot Rope and for Commercial Fishing. It is manufactured for us in Europe in an ISO 9002 certified factory from High Tenacity Polysteel yarns and is about 30% stronger than standard polypropylene ropes. 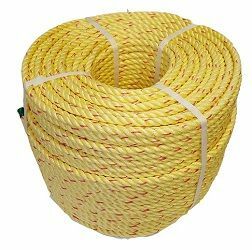 If you are looking for an outhaul mooring rope then please also consider Polyester Rope which will sink immediately, is stronger, softer to handle and has even better UV resistance. This is a 3-strand, firm lay rope with the lead inserted into the middle of one or two of the strands leaving it hidden from view. As with all of our ropes we keep high stock levels for quick despatch and delivery is normally only a day or two away. Discounts are available for full pallet orders, mixed between sizes – please contact us with your requirements for a quote.